The video that opened day two of the International Space Commerce Summit featured the drama, explosions, and stirring musical score of a Hollywood blockbuster. It’s perhaps unsurprising then, that it was produced by the Hollywood producer Ridley Scott. What is more surprising is that it was a trailer for a TV project about the new guard of commercial space entrepreneurs. This is the reality of the new space race – “NewSpace” has permeated the public conscience, if not in name then at least in concept. Space companies are seeking corporate sponsorship and courting media attention, from Unilever promoting their Lynx deodorant brand (that’s Axe for those of us not in the UK, Ireland, or Australia) by offering flights on the serendipitously named XCor Lynx spacecraft, to the Mars One project using the sale of TV rights to fund the colonization of Mars. Celebrities such as Sarah Brightman, Lady Gaga, and will.i.am are all planning spaceflights next year. Indeed, Lady Gaga is intending to perform the first concert from space (Cmdr Hadfield’s “Space Oddity” aside), with the singer planning to incorporate a suborbital flight into a future live performance. Vision of a Mars settlement composed of a series of four person crews (Credits: MarsOne). The industrialist-philanthropists of the new space age are themselves becoming celebrities, with Elon Musk almost a household name. This was in evidence at the International Space Commerce Summit, when the founder and CEO of Mars One, Bas Lansdorp, was cornered by reporters and television cameras immediately after delivering an update on the project. Although coy with details, he hinted at a major announcement in December involving the first unmanned precursor mission, nominally targeted for 2016. When I asked Lansdorp what he considered the single biggest technological hurdle facing them, he replied that it was the entry, descent, and landing system which this 2016 mission will test. This precursor mission will also include a number of scientific payloads, for which Mars One is currently seeking partnerships. Lansdorp also stated that the down-selection of astronauts is currently under way, and that once an initial pool of potential astronauts is established, the public will be invited to vote on who will go to Mars. Given the monumental importance of the first human mission to another planet, it’s important that the crew of the first mission represent a cross section of the world’s different cultures. When I asked Lansdorp about this, he responded that the rules will require that there must be at least one crew member from each continent. Lansdorp also stated that the initial pool of astronauts will be selected for psychological fortitude over skills. The first wave of colonists will be kept busy with construction and other tasks. Subsequent missions will see more of a focus on science. Space tourism was also addressed at the conference, with Xcor delivering a status update on the development of the Lynx spaceplane. Andrew Nelson, the COO, stated that construction of the first flight vehicle is well under way with the wings and other components already delivered and in the process of being integrated. Three hundred and fifty flights have been sold to private and commercial customers, with bulk purchases by companies such as Unilever constituting an increasingly significant part of their sales. Karin Nilsdotter of Spaceport Sweden, and Stephen McKeever of Oklahoma Spaceport, both potential future bases for Lynx flights, highlighted the need for more coordination and cooperation between international spaceports. The formation of an industry body would allow collaboration on point-to-point suborbital flights, promote standardization, and allow for collective representation on political and legal issues. 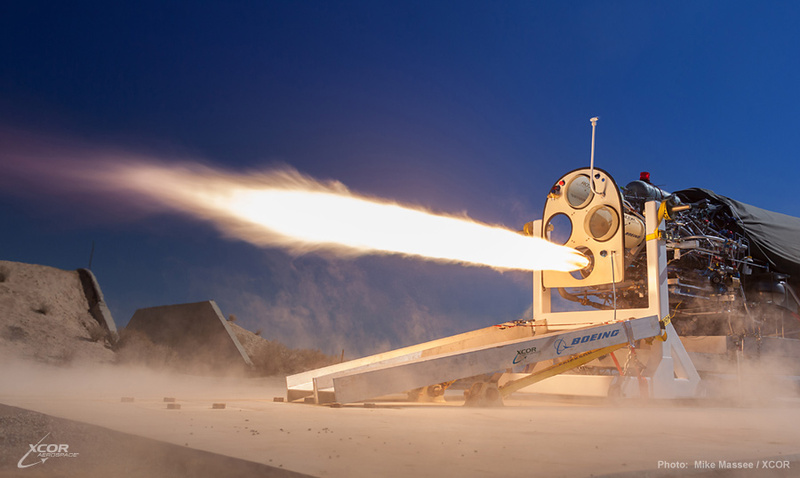 XCOR tests its piston pump propulsion system in March 2013 (Credits: XCOR). Whether or not the commercial space race is successful in delivering regular suborbital transportation, or the colonization of Mars, the market is rapidly evolving, and there was a general consensus that 2014 is to be a watershed year. While high profile ventures such as Mars One, XCor, Virgin Galactic, and NASA’s commercial resupply programs garner the most media attention, there are other more prosaic, but potentially disruptive technological developments on the horizon, and we may not even know what they are yet. Rick Tumlinson, CEO of Deep Space Industries, and Stella Tkatchova, an author and expert on space commercialization, highlighted the uncertainty in predicting future market trends. It was pointed out by Tumlinson that in the California gold rush of the 1840s and 50’s, not many prospectors who came to California seeking wealth were successful, but the gold rush was a boon for businesses supplying ancillary services to the miners, such as Levi Straus and Wells Fargo who made their name during this period. So who are to be the Levi Strauses, and the Wells Fargos of the commercial space era? Tkatchova predicted that some of the markets to keep an eye on are space weather services, in-orbit servicing of satellites, space debris mitigation, and biotech. Space was once the exclusive domain of governments, and manned spaceflight is still a very exclusive club. While human spaceflight will remain feasible only for the wealthy, near space, suborbital, and even low Earth orbit flights are becoming increasingly accessible for researchers with lesser means. Commercial launch providers have reduced the cost per kg to space by an order of magnitude, and reusable launch vehicles such as the one being developed by SpaceX have the potential to reduce it by another order of magnitude. Governments are paying attention, with the most visible example of this being NASA’s Commercial Orbital Transportation System. Dan Rasky of NASA’s Space Portal group explained how NASA Space Act Agreements are being used to spur commercial growth in the space sector, enabling spin-off and spin-in between NASA and industry. We also heard from Tim Just about how the UK government is looking at US style procurement, as well as other more novel approaches to drive innovation and leverage entrepreneurship in the space sector. Commercial involvement in spaceflight is, of course, nothing new. It was after all companies like Boeing, Rocketdyne, and Rockwell that built the Apollo and Shuttle hardware under government contract. Indeed, most of those in attendance represented this old guard, men in business suits from organizations like Astrium and Eutelsat. That they sat attentively and listened as XCor explained their plan to fly humans into space on a single stage spaceplane, and Mars One detailed their Mars colonization plans suggests, though, that something has changed. Entrepreneurs and small to medium enterprises are now taken seriously in the space arena, boosted by the public successes of companies like SpaceX and Scaled Composites. Image caption: Bas Lansdorp at the 2013 International Space Commerce Summit (Credits: Andrew Henry).